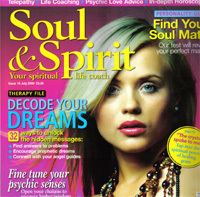 Fans of "A, B, and C" actress Bettine Le Beau will be delighted to hear that a 2-page article about her life, career, and beliefs can be seen in the July 2009 issue of "Soul & Spirit" magazine. Written by Spencer Lloyd Peet, the article includes several photographs (including shots of Bettine alongside Richard Branson, Eric Morecambe, and others). Bettine's official website can be found HERE. With thanks to Spencer Lloyd Peet for this news item.